$20 glasses have LED lights, a Faux-pedia of commands, and look pretty darn authentic. It’s no faux pas that we designed these toy glasses to look ‘faux real.’ The reaction from people in the know has been hysterically funny. Anyone who shelled out $1500 to be a member of the first generation of elite augmented reality users felt ripped off. Anyone who didn't, felt left out of the club. Now there’s Faux Glass. Built to look like a powerful augmented reality wearable, Faux Glass lights up in amazing colors, includes a magnifier and spotlight, and has a series of commands that don’t do much of anything but bring a smile to anyone who sees them. The Backstory: Created by longtime journalist and tech expert Robin Raskin, Faux are meant as a reminder that tech shouldn’t take itself too seriously. Faux means fake, and these fake toy glasses are meant to serve as the ultimate meme to an industry enamored of their own ideas. 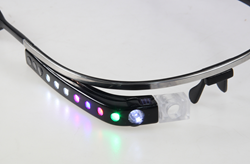 The glasses’ eight LED indicator lights can turn on one at a time or cycle through a psychedelia of color. Each light sequence corresponds to a “crack me up” command, like: Where the Faux (the product’s built in GPS to nowhere), Faux-to Shop (for fixing photos never taken), and What the Faux (for general searching). Users are encouraged to take advantage of different Indiegogo perks including Faux Party Packs, group photos, Faux certificates and real Faux caps. The glasses will be available for sale on the Faux Glass website in December. At that time, the Wall of Faux will become a contest. If your Faux selfie is chosen by popular vote, you'll be able to join us during International CES in Las Vegas and participate in a FashionWare Runway event hosted by Robin Raskin’s conferences and events company, Living in Digital Times. Faux Glass is a product of FauxWorld, LLC. Robin Raskin is a tech journalist, author and founder of Living in Digital Times, a conferences and events company. She and her team created Faux as a call to play.